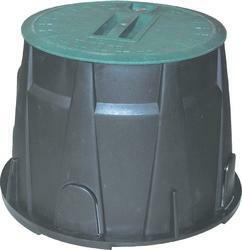 Our range of products include polyplastic earth pit chamber and chemical gi earthing electrodes. The lightweight, heavy duty earth pit chamber with its unique design has resulted in performance capabilities superior to the traditional concrete pit, at a similar cost. Manufactured from a high performance polymer, the lightweight, heavy duty earth pit chamber is UV stable and chemical resistant. The lightweight earth pit chamber weighs only one tenth of the conventional concrete pit yet is load rated to an impressive 5,000 kg. It has a lockable lid and improved working area compared to the concrete inspection Pit. In addition, the features incorporated within its design ensure ease of storage, reduced transportation costs, ease of installation and ease of subsequent inspection and testing of the earth electrode system, therefore providing significant practical benefits to both installers and the customers. Feature & benefits Light weight construction The earth pit weights only one tenth in comparison with a massive 30 kg for a concrete pit. High load-bearing capacity Safe working load of 5,000 kgs or more superior to that of the traditional concrete pit. Lockable jam free lid Once installed the lid can be locked to prevent tampering with the earth electrode. Once locked, the design of the lid is such that debris cannot become jammed between the lid and the surround. Unbreakable material The high performance polymer is significantly less brittle than concrete, reducing the likelihood of wastage due to breakages. Stackable design Resistant to most substances, including petrol, oil, diesel, bitumen and concrete. UV Stability UV additive minimizing the effects of direct sunlight. Wide temperature applications Capable of withstanding a wide range of temperatures. Improved working area A larger working area, with improved access, simplifies both initial installation and subsequent inspection. Rod placement area This ensure that the Earth Rod is centrally positioned, simplifying earth clamp connection. Screw retention facility The stainless steel, rustproof screws may be snapped into the lid, preventing loss whilst in storage or on site. Optional Earth bar facility An earth bar may be inserted in the pit to allow for multiple connections to the earth rod. Quality assurance Fully Compliant to the manufacturing quality standards. Environment friendly rust proof heavy duty weather proof polyplastic earth pit chamber Model: PPC 01MAIN FEATURES Factory built long holes for accessing strips/ wires at four side. Made of heavy duty polyethylene for extra durability. Resistant materials, assuring long use-life. Green top cap matches the environment. JK make GI Earthing was hot dip galvanization of 80-100 microns. The space between outer dia & inner dia was filled with a highly conductive & non -corrosive compound which safeguards the electrode getting corrode over a long period of time under the soil.